It was so good that for a fleeting moment, I forgot where I was when instagramming and did my default good times hashtag: #sxsw. You can write all the reviews you want, but that was a subconscious mistake and the truest indication of how fun TURF day 4 was. d) I had no shoes I was willing to sacrifice to the mud lords. 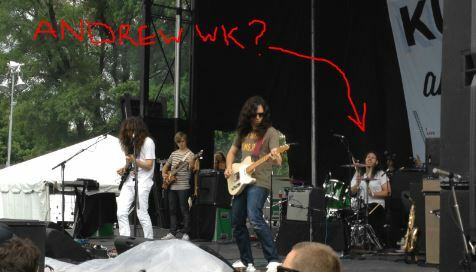 Is that drummer NOT Andrew WK? Have they ever been spotted at the same place together? Someone investigate this. If you have never heard Kurt Vile before, the easiest way to explain their music is to ask you to look at their picture, project what you think they would sound like and then tell you that you are exactly correct. Semi lo-fi honest American rock music. One thing I liked about this set was that it got progressive louder and more aggressive as they got closer and closer to the end. Vile’s somewhat muttered vocals might not make for great singalongs but when they go at it with the guitar (and/or sax), it makes for a pretty good head boppin time. Next up was Hoboken New Jersey legends Yo La Tengo. Yo La Tengo has always been one of those bands which I think I should know, but I do not. The most amount of time I have spent with this band up before Sunday was the Parking Lot Movie, which featured James McNew. Aside from that, I can’t say I know much about Yo La Tengo except for that little inner feeling that I should know more about them. Kind of like how I feel about some of my relatives. Much like Kurt Vile, the band started off with some really mellow tunes. I think this may have been due to some equipment issues. Either way, the set started off mellow and then become progressively louder with Ira Kaplan getting more and more crazier on a guitar, much like how your uncle seems to be just content with having one can of beer, and the next thing you know, you are doing absinthe at a shady strip joint. It should be noted that Yo La Tengo’s set was the only non-rain set for the day. They also said they missed RA Dickey, which would have been a great crowd pleaser if he hadn’t got lit up the previous day. Whitehorse are a husband and wife duo who were clearly a little bit country, based on Melissa McClellan’s country boots, but also, still a bit indie rock, based on Luke Doucet’s plaid shirt and fedora combo. I actually don’t know if Doucet’s plaid+fedora combo actually says indie rock, because he wore it with an exposed white tank top underneath, it actually screams “I’m a western tourist coming to a semi poor country, please rob me accordingly” for some reason. Anyways the duo were all full of harmonizing bluesy folksy rock that sounded pleasant, but wasn’t enough to hold me and friends from wandering the grounds in search of food. Let’s take a look at the food I had during TURF while we are at it. I was lucky enough to win a free burrito courtesy of TURF and I chose the pulled pork burrito. I was expecting a large burrito, but instead I was handed probably a 5 inch burrito that was already pre-wrapped. This was somewhat disappointing as one of my favorite things to do when ordering burritos is to pick what I want. This way I can have a conversation with the minimum wage worker on the other side, feel like we’ve had a connection and thing, yes, we are humans after all, this isn’t a souless paper transaction. I also usually take that time to ask for more hot sauce. Since the burrito was pre-wrapped, I had no idea how long it had been sitting there and as a result, I felt like it tasted like it had been sitting there awhile and thus not fresh. I wasn’t really full from my free burrito, and taking a look at prices for food as well as contemplating the long stretch of time I was there for, I decided the best option was to carb it up. The Poutine Machine offered only a medium and large size poutine. I chose the medium since I have learned that large size poutine is never a good idea. I enjoyed this poutine, there was real cheese curds and the fries were fresh and not overly salted. The gravy was tasty as well. If I was a vegan I would complain that there was no veggie gravy option. I’d also complain that I couldn’t eat meat. I didn’t really know Aussies liked meat pies until I went to this stand by Kanga. This was probably my favorite meal here. The meat and the gravy inside the pie tasted fresh and the pastry was tasty as well. What would have been better if they had offered kangaroo or koala meat. I don’t know if those are legal here though. Feng’s Dumplings – Udon and Dumplings. Feng’s was my chosen carb fill of the night and it was tasty. It’s really hard to screw up udon but their version was good because it was large. The sauce was probably sugar and soy but still tasted nice. The dumplings were nice and crispy on the outside while warm on the inside, which is the right combo you want for a dumpling. I don’t know what’s so Taiwan about udon though. It should of been braised beef noodles, but I’m not complaining. The best value for the buck on the grounds. Part 2 to come later – Xavier Rudd, Cat Empire and Belle & Sebastian! This is the third part of a three part series reviewing the first night of TURF. Thanks to our blogger friend Adam for his contributions, one day, I will upgrade him to a real life friend. 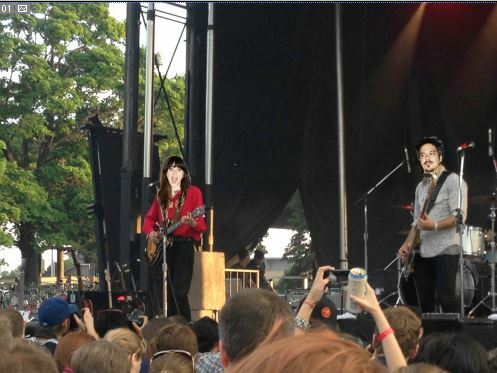 As one would expect, controversy plagued the She & Him show. Adam: First off, why no photo pit She & Him? Also why no letting the VIP guests (WHO PAID A SHITLOAD EXTRA) into the VIP area?!?! That’s not nice, She & Him. Your songs can be best described as Zooey’s character on The New Girl; pretty, sweet, vapid. I did enjoy lying out on the grass with my eyes closed listening your music. Until you covered “You’ve Really Got A Hold On Me.” Ugh! NO ONE CAN COVER THAT SONG… Unless you’re THE BEATLES! Are you the Beatles? Didn’t think so. a) took out cameras to get a shot of She & Him when they took the stage, much like you know, what happened when Camera Obscura and Joel Plaskett took to the stage. We live in an age now where people MUST take pictures at a show. They HAVE to post about it on facebook or twitter. It’s going to happen. Accept it. h) oh yeah, She & Him are playing! Set wise, as anyone who have heard any of the three She & Him albums can attest to, a She & Him show is like hoping aboard a delorean back to the simpler times. The bands retro-sounding pop sounds great on a summer night and the songs are so gosh darn sweet I feel like I left with a cavity. M.Ward’s still got those guitar chops and they had an older gentleman in a top hat who did an impressive whistle solo. Laid against the starry night backdrop, all the elements were there for a pleasant evening time show, if it wasn’t completely railroaded by the no photo ban. Never Wanted Your Love, a single from the new album sounds like an instant classic. It also sounds like it could have been written by Randy Newman for some pixar movie. Maybe that’s in the works. There was a bevvy of covers too, although some, including Unchained Melody came off as a bit awkward. As expected, Zooey Deschanel came off as completely adorable on stage, as did her taller, blonder backup singers. At one point she asked if anyone was going to drink beer the giant inflatable Coors can lurking near the back of the grounds, which struck some people as cute, but Paul thought it was a bit lame, to which I replied that she probably needed a script. I thought that was pretty funny, but I always think I’m funny. Anyways, In the Sun finished off the main set, and then in a shocking move, Zooey Deschanel pulled out a Postal Service record and ripped it in half. Okay, that didn’t happen, but how cool would that have been? We wouldn’t have the visual evidence to prove it anyways. This is part two of our three part series. I have enlisted my friend Adam from Never Had to Fight to help provide an additional opinion about the show. Two reviews for the price of one! 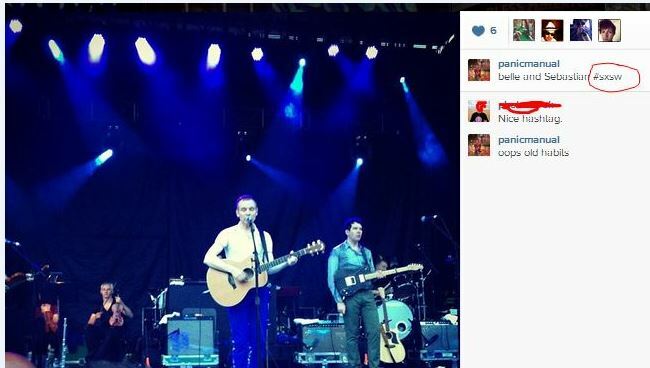 Adam: What can I say about Plaskett? I’ve seen him a few hundred times already. He’s an entertainer, he knows how to put on a good show. Sure I might not really dig Scrappy Happiness, but the set overall was a lot of fun. My only comment would be that I took out my ear plugs three times during your set thinking that the set was over, but then you started tuning you guitar… Why am I writing it to Joel, he’s not going to read this… we’re not FB friends. Well, hi Joel. Long time no talk. Ran into your friend Peter a few weeks back at NXNE. You should tell him to grow his beard back. Mmm, beard. Ricky: In my opinion, Joel Plaskett should have been the closer for the night. When a baseball team wants to end with a win, they bring out their fireball closer with the 90 mph cutter, not the lefty specialist with a 80 mph 12-6 curveball. As always, Joel brought his A game. He’s been around since some of my friends were toddlers but I feel like Joel Plaskett has been gaining more and more momentum lately. The legend is spreading. There’s a good reason why – the man’s live show just rocks. You could say they are … (David Caruso glasses) extraordinary. Love This Town is such a classic song, I mean, he probably plays it in every city, and then at that point during the show, everyone at the show might actually for a brief second, actually love where they are living. Even people in places like Regina or Winnipeg. That’s power. 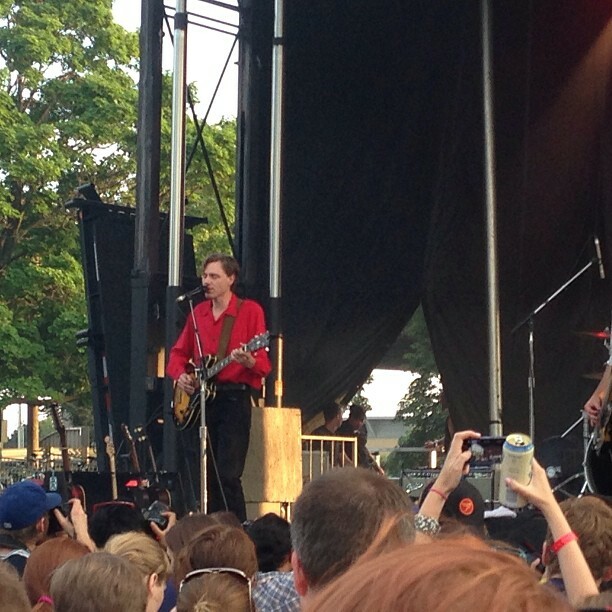 All in all, Joel Plaskett was a good 90 minutes of good ole Canadian rock. You know it’s good when the festival’s promoter is off to the side windmilling along to the drum beats. Yesterday hopefully marked the beginning of a new era. It was the first day of TURF aka Toronto Urban Roots Festival, a new and hopefully longstanding new tradition in Toronto. A summer festival in downtown Toronto in the summer, how convenient! 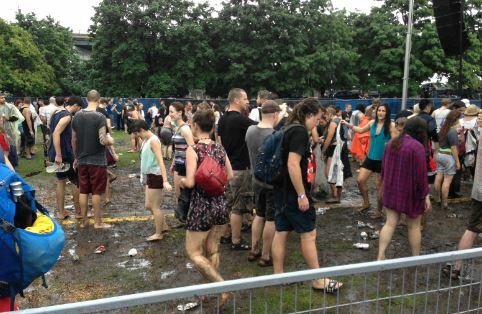 It’s also the first festival in Toronto I can remember where you can drink anywhere. How European of us. The beers however, were nine dollars. How non-European of us. Still, it is a step in the right direction. 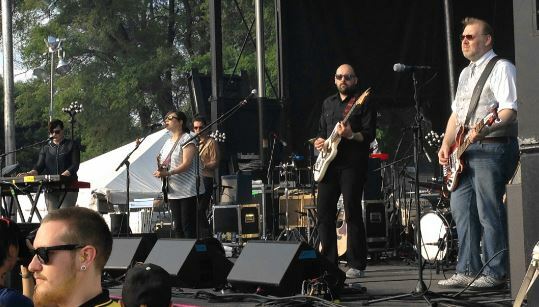 Thursday’s lineup was an exceptional one, featuring the Barr Brothers, Camera Obscura, Joel Plaskett and She & Him. The crowd was fantastic, it was pleasantville. After I got home last night, I saw my friend Adam of the blog Never Had to Fight had posted his opinions. At first I thought, what an ambitious jerk, getting his review up so early. Then I realize it was a good opportunity to just use his review as a starting point for my own reviews. It’s always good to hear different opinions on a show, after all, that is why we are all here, right? So here is a ‘he said, he said’ sort of review. Editors Note: I broke this into three posts, because it ended up being way too long. Ricky: While the B&S comparisons are obvious (they are Scottish and also their first album was produced by Stuart Murdoch), I like to think that Camera Obscura are just their own sunny disposition twee/indie pop band. Having just released their fifth album, Desire Lines to glowing reviews the band was in good spirits on Thursday. Despite not getting Suspended From Class, we still got some classic gems including Lloyd, I’m Ready to Be Heartbroken”, Teenager and French Navy. The new tracks blended in nicely with the old, which was not a surprise as all the albums have that consistent sound to them (sometimes to their detriment). I regret not wearing my Camera Obscura t-shirt, but that might have been lame. Camera Obscura had my favorite banter of the night, saying how they don’t always wear shades on stage as well as mentioning how much they love the weather once the sun was down. I guess it’s very UK of them to talk about the weather. Way to fit stereotypes. Still, A pleasant way to start off the evening.